She was the prettiest lab puppy we had ever seen and the family immediately fell in love with her. We named her Onyx because of her thick, black, shiny coat. She spent her first vacation with us when only 10 weeks old, she had her first bath and first swim in the St. Lawrence River. We had no clue that this amazing little ball of fur would impact our family in a heroic way. Onyx was a wonderful hunting dog, never afraid to show up her larger, more mature counterparts. She would not hesitate to crash through the ice on a tributary of the Chesapeake Bay in order to retrieve waterfowl. She braved the defensive posture of a hissing, wounded goose to bring it back to her master. She loved being by her master’s side, whether in a duck blind or riding in the front seat of the pickup truck. Onyx smiled. It was a real people-like smile, but it intimidated those who didn’t know her. Strangers misunderstood the showing of her teeth until they saw the upturn of her lips. If she was happy and content, Onyx smiled. When she wasn’t hunting, Onyx enjoyed all of our family activities. 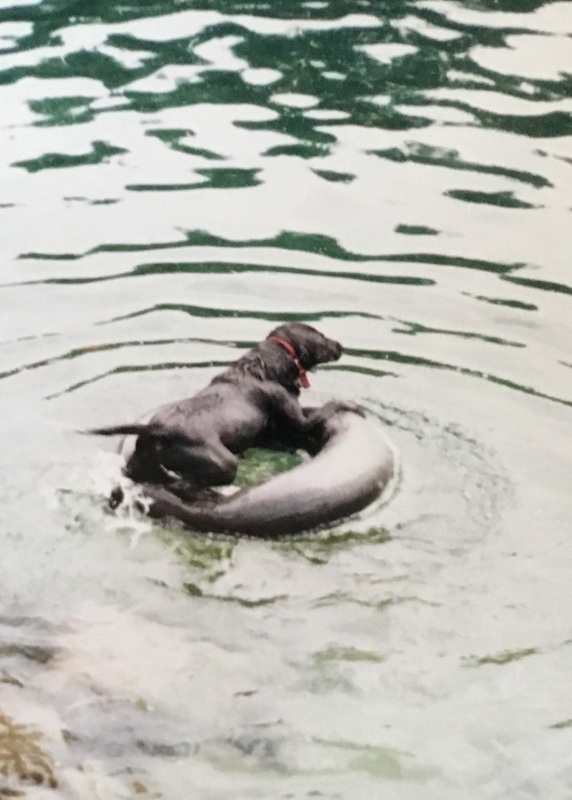 On hot summer days, when the humidity was oppressive, Onyx enjoyed floating on the river with us in her own inner tube. Resting her front legs and paws over the edge of the rubber tube, her eyes would droop shut and she floated until she’d had enough of the warm sun on her black coat. Occasionally, Onyx floated with us while standing on a huge tractor tire tube that had been inflated just for her. Amazingly maintaining a 4-point stance on the top of the tube, she smiled while showing off her perfect balance. One hot day our eighteen-year old daughter, Margie, announced she was going to swim across the bay. No one in the family was free to go with her. The unwritten rule, regardless of swimming ability, was to have a buddy in the water with you especially when swimming the width of the bay. Margie never argued that rule even though she had been an accomplished member of a swim team for many years. Having heard her name, Onyx roused from a nap, ready for action. “Go with Margie.” He said to the dog. Margie beckoned to the dog with a hand signal. Onyx trotted to the water next to her. They entered the chilly river together and side by side swam across the bay. I watched from the deck as they reached the sandbar on the far shore. Margie stood and smoothed her wet hair back from her face. They rested a few minutes before shallow diving into the water for the return trip. Onyx began swimming circles around her, sensing the distress. Margie was trying to massage the cramp but began struggling in the water. I ran to the dock, got into the boat and started untying the ropes wrapped around the dock cleats. Onyx knew Margie was in trouble. She came up behind and to the side of Margie, poking her head underneath the girl’s right arm. Margie, desperately grabbed onto Onyx’s collar. 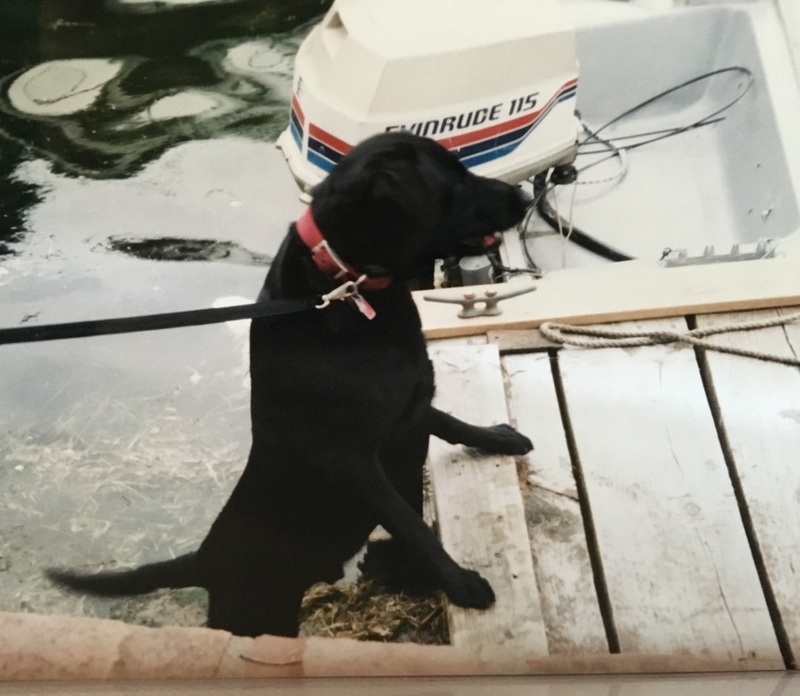 Onyx began digging deep, slicing through the water with her webbed paws, swimming with every ounce of strength to bring both of them back to the dock. Watching the drama, I realized I didn’t need to take the boat out. I simply waited until the pair approached me. Calling out encouragement to both my daughter and my dog, as they got closer, I extended an oar which Margie grabbed and held onto with one arm, the other gripping our heroic dog’s collar. Onyx brought our girl to the safety of the shore where her father and I could help her get out of the water. Onyx jumped up onto the dock and shook vigorously several times. After Margie was wrapped in a large towel, she lowered herself to the grassy front lawn to rest. Onyx eagerly ran to her covering her face with sloppy dog kisses. Wrapping our arms around both of them, we praised our amazing dog and gently tousled Margie’s wet hair. Everyone was grateful for their safe return to shore. Later in the afternoon, Onyx got an extra treat. She didn’t quite understand all the fuss, she just wanted to jump off the dock again and swim around in the bay. During subsequent family gatherings at the summerhouse, we’d reminisce and lift our glasses to our amazing Onyx and the day she became a hero.